By Jon Greenberg on Wednesday, July 25th, 2018 at 5:41 p.m.
Update: The White House updated its transcript the day after the Washington Post article cited below and two days after the Rachel Maddow Show raised the issue. Right after President Donald Trump and Russian President Vladimir Putin had their news conference in Helsinki, a writer for The Atlantic magazine highlighted a curious omission in the White House transcript. A Reuters reporter had asked Putin, "Did you want President Trump to win the election and did you direct any of your officials to help him do that?" To which Putin replied, "Yes, I did. Yes, I did. Because he talked about bringing the U.S.–Russia relationship back to normal." Atlantic staff writer Uri Friedman looked for that on the White House website and came up empty-handed. "The exchange doesn’t appear in full in the White House’s live-stream or transcript of the press conference, and it’s missing entirely from the Kremlin’s transcript of the event," Friedman wrote. MSNBC host Rachel Maddow took the discrepancy to heart on her July 24 show. For context, she said sometimes transcripts are wrong. "When that happens, reporters point out something that's wrong or missing or mischaracterized and then the White House later makes a fix," Maddow said. "The White House is not correcting it," she said. "It is still incorrect tonight. 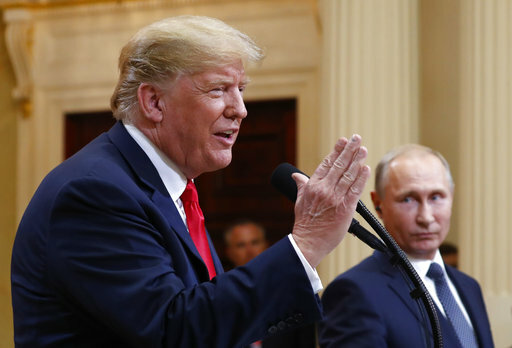 The incorrect transcript dropping out the question when Putin was asked if he wanted Trump to win the election, and we can report that the White House video of this exchange has also skillfully cut out that question from the Reuters reporter as if it didn't happen." For Maddow, this was a clear case of Trump rewriting history to bury an inconvenient reminder that Putin was rooting for him in the election. But was the discrepancy as nefarious as Maddow suggested? The Washington Post’s Philip Bump listened to the video from the White House, the Washington Post and Fox News. In the first two, the question is barely audible. In Fox News’ version, it’s much more clear. Bump said the explanation is technical. The audio at the conference was split between the left and right channels. "At some point in the middle of that question, there’s a switch between the feed from the reporters and the feed from the translator," he wrote. "In the White House version of the video, you can hear the question being asked very faintly under the woman who is translating." In contrast, Fox News had both the channels (listen at 37:40). In one, there is the translator. In the other, the reporter’s question. Bump noted that the Washington Post’s initial transcript, provided by Bloomberg, also lacked the important question from Reuters. Any group listening only to the translation side would have a hard time getting the full question, and so it was left out. Maddow responded to Bump’s assessment. "This is one possible explanation for why the White House transcript and video from Helsinki doesn’t include Putin saying he wanted Trump to win," she tweeted. "But Putin really did say that in Helsinki and the White House transcript and video still does leave it out." Maddow asked whether the White House would fix its transcript. As of the time we published, it had not. The White House later updated its transcript. Update: After the White House updated its transcript, we updated this article.